This was my starting point for the 2020 challenge: Block 10. 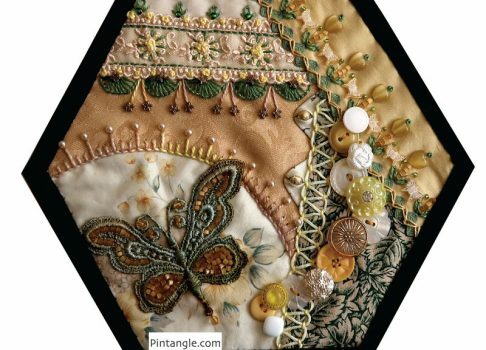 When I teach crazy quilting classes, beginners often worry over the look of an unembellished crazy quilt block. To be honest, many blocks start out looking doubtful, but by the time a block is embroidered and embellished, it looks totally different. I hope that sharing a photo of the bare block helps you to see that the stitching adds another layer of visual interest and can often pull a block together. So, if you are new to crazy quilting, don’t fret too much about how a block looks when you begin. Just keep on stitching! Here is the basic pattern of my 2020 challenge Block 10. Feel free to use it if it appeals to you. 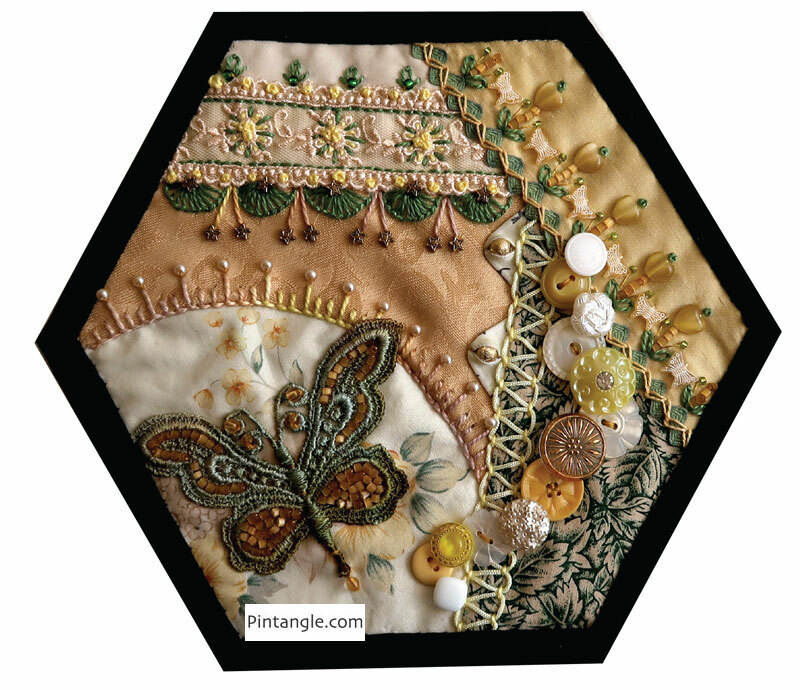 My hexagons have 4-inch sides and measure 8 inches across from point-to-point, but you can use this pattern for other sized hexagons too. 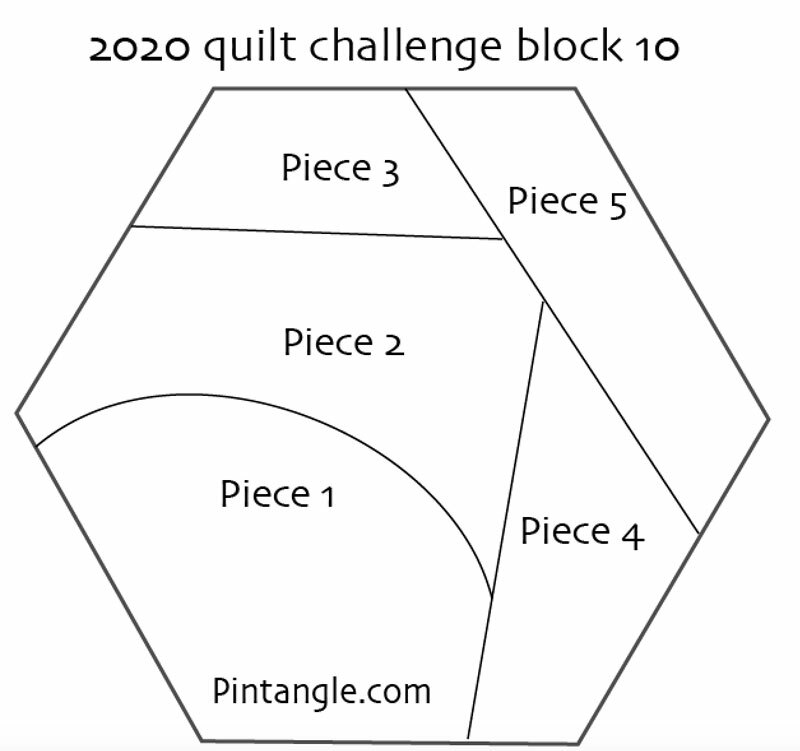 Before I chatter on about these details, remember that the aim of the 2020 challenge is to use 2,020 different items on a quilt by the end of the year 2020. Items can appear twice but must only be counted once. An item can be material, technique or stitch. The first photograph highlights a lace motif that I beaded on the block. 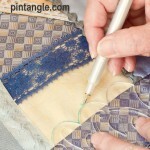 The photo also features a curved seam of buttonhole stitch that I worked in a hand-dyed cotton Perle #5. I topped the stitches with small pearl beads. This seam was started off with the ric-rac which I tacked down, then secured to the block with zig-zag chain stitch. Then I decided to decorate one side of the seam using a line of detached chain (not counted as a stitch because it was counted on block 1) and then straight stitches arranged in a fan-shape to give me a starting point for the pattern. Next, I added a line of amber/gold beads before adding the heart-shaped beads. Between these, I stitched a line of small butterfly beads. 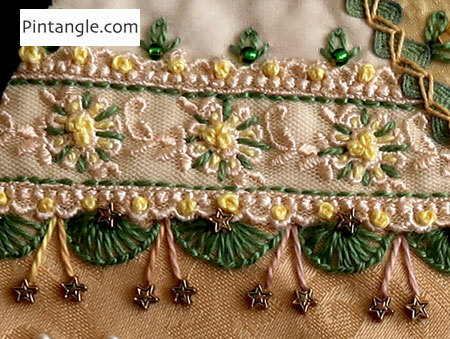 I further embellished the lace-covered seam with French knots (not counted as a stitch because it was counted on block 1) worked in yellow cotton perle #5, before I decided to go further in decorating the side of the lace. I started with a line of half buttonhole wheels. Then added the star-shaped beads. 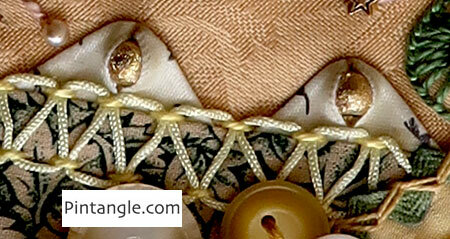 I covered this seam in Stepped Threaded Running stitch. The threading was done with yellow chainette thread. The seam also features another technique counted in the project. I made prairie points out of satin ribbon then tucked beads into them. This photograph features the button cluster. on this block, I went a bit overboard as I managed to stitch 13 buttons on it! I had fun here for sure. It took me hours to decide which button looked best with which, changing my mind numerous times, but finally settled on this cluster. So the moment of truth. What is the count on 2020 challenge block 10? 2020 challenge block 10 bring the total of items used to date to 267! As someone who loves crazy quilting and embroidery, I designed these templates with my fellow stitchers in mind. 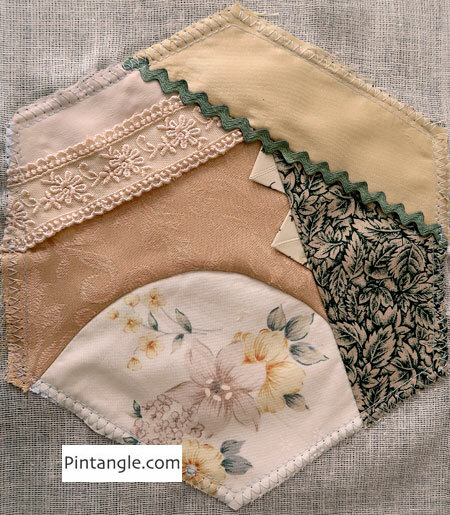 With my templates, you can create hundreds of different patterns to apply to your stitching and crazy quilting projects. They are easy to use, totally clear so you can position them easily and they are compact in your sewing box. As always, your work is beautiful! I love the incorporation of prairie points with the ribbon and filling them with beads. Gorgeous! Oh, it is another stunning block. You are so good at combining beads and thread. I have been working on a cq project, lovingly called Crazy for Crazy. The last block, however, I found so uninspiring. Do you ever suffer from ‘stitcher’s block’? 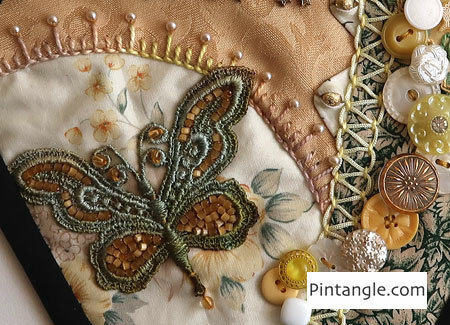 Thanks Queenie – yes I often get a bit stumped while stitching – I pin it on the wall and leave it there for a few days then one day I look at it in passing and think – Oh I will so this or that or what ever pops in my head. As always, I love it! Ann B.
I enjoyed looking at all the pretty details. Love the beads inside the prairie points! You continually amaze me with this project! So so beautiful Sharon! Thank you for all you do to inspire.